A subfloor is a wooden substrate that is put in for structural support of the final flooring. Plywood is one of the most common subfloors in use today. It comes in a vast array of sizes, types, and configurations. Different types of plywood are made from a variety of materials, and are manufactured using a variety of processes designed to provide a finished product that’s well-suited to the intended use. Several types of plywood are suitable for subfloor use. Whether you’d like to lay down a new subfloor or take on a DIY plank subfloor repair, plywood is the clear choice. Oriented Strand Board (OSB) is structurally engineered for strength. OSB is made with multiple laminated veneer layers. The manufacturing process uses wafers of wood that a binder presses together in order to form the finished panel. OSB is commonly confused with particleboard, but the two products are very different from one another. The main difference is that OSB has much more structural integrity then particle board. OSB is the most popular as far as structural panels are concerned. The most common traditional or veneer plywood is CDX. It is similar to other types of laminate plywoods except that the outer laminate grades are C and D which means that one side is rough and the other side is rougher. It isn’t uncommon for this type of plywood to have defects on its surfaces, but they are often available much cheaper than A or B grade plywood. CD plywood is typically used in places where it won’t be seen, helping to cut down on project costs. The X in CDX indicates that the plywood is designed to withstand some exposure to the elements. Similar to OSB, it is a great option for things like a subfloor or exterior sheathing. OSB is more water resistant then CDX is. Of the two, it’s the better choice for subfloors in kitchens, bathrooms, and other areas that might be exposed to moisture. Tongue and groove plywood, which is often referred to as T and G, features jointed edges with a tongue on one end and a groove on the other. Think mortise and tenon and you’ll get the idea. As with old-fashioned tongue groove plank subfloor, this product features a ridge that runs along one of the plywood’s edges. This edge fits into the slot one the adjoining piece of plywood. Both OSB and CDX subfloor plywoods are available with the tongue and groove arrangement. This is excellent for subfloor, as it helps prevent the plywood edges from moving around and squeaking once they have been installed. It’s a great choice for covering old plank subflooring, too. If you want to make a better seal on the grooves, you can use construction adhesive while setting each piece of tongue and groove plywood into place. Check local building regulations for subfloor thickness and other requirements before you get started with this project. In most areas, plywood subfloor thickness is typically going to be at least 5/8″, with the most common size being 7/8″ thick. Some subfloors, depending on the climate in your region, can be even thicker than that. In some cases, homes do not have a multilayer floor construction, omitting the subfloor. In cases like this, the subfloor will be added during the remodeling process. When you install your lumber joists, if they are not already installed, you want to make sure that they are installed and held vertically. You have to do this to ensure that they don’t end up twisting. Twisting is bad in this situation as it can potentially weaken them to the point of failure. To achieve a proper vertical installation you need to first carefully install the rim joist. It is important to keep in mind that these solid joists stand up better in a fire and also provide more structural support. During installation, it is a good idea to install the joints exactly 16 inches on center. Now, there will be times that you have to go shorter than 16 inches, but you will have to cut the plywood to accommodate a shorter length. It is not recommended to go further than 16 inches unless you have checked and checked again the spanning distance. Doing so may create weak spots in your floor. By sticking with the 16 inch on center rule you will find that each piece of plywood over plank subfloor has 7 joists under it. In addition to this, each piece of plywood will end in the center of a joist. 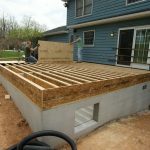 In order to ensure that the plywood starts at the edge of the house, the first joist will have to be installed 16 inches on center from the house edge. 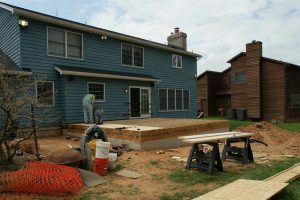 It’s fairly easy to install plywood over subfloor, but you’ll want to give yourself plenty of time to complete the job. If it hasn’t already been done, clear the work area. Next, pry off any baseboards that will be in your way. Once that is done you will pull up the existing flooring, such as the linoleum or the carpeting. Now, all that remains is to follow these simple instructions for how to install plank subfloor over existing floor. Take a sheet of plywood and lay it square in one corner of the work area. You will want to make sure that you leave at least a 1/8″ gap between the walls and the plywood sheets. This allows for natural expansion and contraction. Screw or nail this piece of plywood into place. I recommend using wood screws at nine-inch intervals. It is also recommended that you countersink your screws into the plywood so that the heads of the screws don’t cause you problems later. Your power screwdriver is an excellent tool for this. Now, depending on the shape of the room, you may need to cut the next piece to shape. If so, go ahead and measure and cut that piece so that it is a sure fit. Don’t forget to leave the gap by the walls. If you cut this plywood yourself it would be a good idea to lightly sand the edge so that you can prevent splintering. Finally, continue to cut and place the plywood until the floor has been fully covered. Now you can install the floor coverings, whatever they may be. Once you re-install your baseboards, your flooring project will be complete.